invasive plant species to establish. They can also prey on livestock. The geographical extent of wild pig damage in California is currently unknown making it difficult to mitigate and manage losses, and estimate the economic impact on private landowners and public lands. 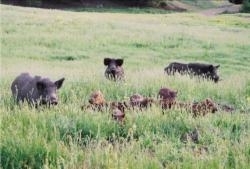 UCCE Livestock and Range Advisors and Wildlife Specialists need your help by filling out a short statewide survey on wild pig damage found at: http://ucanr.edu/survey/survey.cfm?surveynumber=16522. It should only take about 15 minutes to complete. Individual identities and survey responses will be kept confidential. Participation in the survey is entirely voluntary. In conjunction with the survey we have developed a smart phone or tablet app that will help landowners and managers identify and record feral pig damage so that we can estimate the land area and economic impacts of feral pig damage over a longer time period. If you are interested in participating in data collection using our mobile application, please fill out the survey and indicate your interest at the end. If you have questions about the survey or would like a paper copy, please contact either UCCE Livestock & Natural Resources Advisor, John Harper, at 707-463-4495 or jmharper@ucanr.edu or UCCE Wildlife Specialist, Roger Baldwin, at (530) 752-4551 or rabaldwin@ucdavis.edu. John M Harper: You're welcome! Ryan Keiffer: Website looks great John.